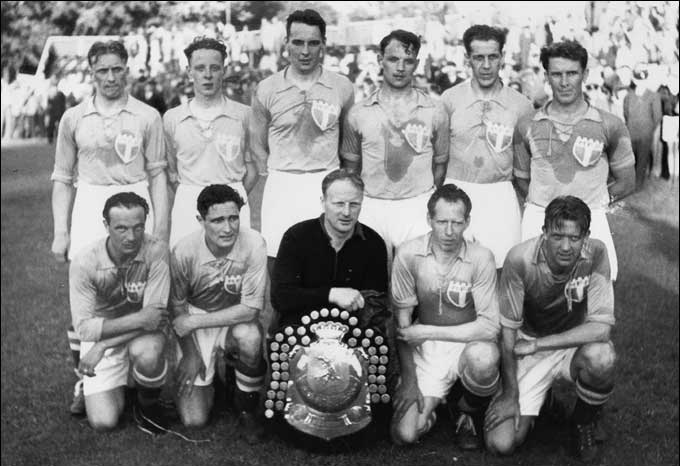 Malmö FF's soccer team won their first Swedish title in 1944. Five years later, they had built such a strong team that they won three titles in a row, and were undefeated for 49 league-matches. The 1949-50 season was their best, winning no less than 20 of their 22 games. Life in Sweden just after the Second World War was way better than in most parts of Europe. Sweden stayed neutral, and the country didn’t suffer that much. The league wasn’t postponed and could maintain a higher level than most countries could. Maybe that’s why Swedish soccer had a very successful spell at the world stage, in the years immediately after the war. First they managed to win the Olympic title in London, in 1948. 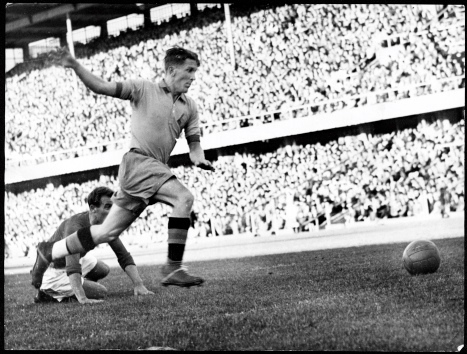 Two years later at the 1950 World Cup, Sweden did lose against host Brazil 7-1, but still claimed the bronze medal at the end. The first great Swedish team from 1945 onwards was Gunnar Nordahl's IFK Norrköping, winning the league four times (1945 until 1948). Then, in the 1948-49 season, Norrköping got off to a bad start and never recovered. Also, star striker Nordahl left for Italy (AC Milan) halfway through the season. This meant Helsingborgs IF and Malmö FF got into a game of musical chairs for the championship. Finally, Malmö FF ended the season with five victories to clinch the title: 2-1, 6-0, 12-0 (three goals by Borje Tapper, Stellan Nilsson and Carl-Erik Palmer, two by Kjell Rosén and one by Egon Jönsson), 5-1 and 4-0. At the start of the 1949-50 season, the Swedish Allsvenskan league again lost a few of their best players to Italian clubs. Gunnar Gren (IFK Göteborg) left for AC Milan, and so did Nils Liedholm (IFK Norrköping). Elfsborgs Ake Hjalmarsson went playing for AC Torino. Champion Malmö FF wasn’t affected by this at all, and started the season where they left off a few months earlier: by winning all their matches. On September 11 for example, they crushed IFK Göteborg by 9-2. Only Jönköping Sodra could keep up with Malmö FF. After nine matches, Jönköping Sodra were just four points behind. 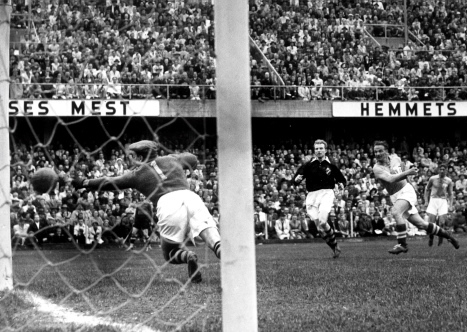 Then the two teams met on October 9, 1949, at the Malmö-stadium. With a 4-2 win Malmö FF buried all hopes for Jönköping. When looking at Malmö FF’s team roster, it’s remarkable to see that no less than six players were born in 1922, and four in 1921. They were all in the best years of their career, both in experience and in strength. Only goalkeeper Helge Bengtsson and Erik Nilsson (both 33 years at the start of the season) were older, while promising youngster Carl-Erik Palmer (20 years) was the rookie of the team. 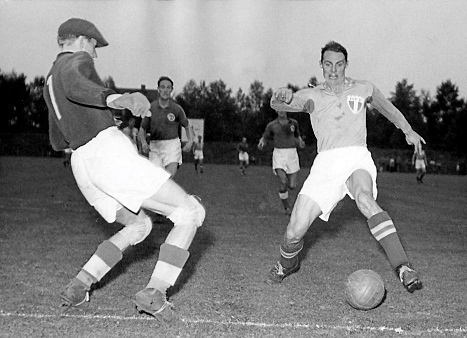 Erik Nilsson was voted Swedish player of the year in 1950, Ingvar Rydell was the top goalscorer with 21 goals (number two, Hans Jeppsson (Djurgårdens IF) scored 18 and number three, Karl Simonsson (Jonköping Sodra) managed 16). After the season, the Swedish national team - with eight Malmö FF-players - left for Brazil, to compete at the 1950 World Cup. They got off to a good start, beating Italy 3-2. Thanks to Hans Jeppsson (2 goals) and Sune Andersson (1 goal) and Helsingborgs goalie, Kalle Svensson, who was nearly unbeatable that day. Svensson also was outstanding in the match against Spain, giving him the nickname ‘Kalle-Rio’. Although Sweden lost against host Brazil (7-1) and soon to be world champion Uruguay (3-2), they ended the tournament with a bronze medal. Out of the other players of the Swedish squad, Gunnar Johansson (GAIS, to Olympique Marseille, Fra), Brorr Mellberg (AIK Solna, to Genoa, Ita), and Börje Tapper (Malmö FF, to Genoa, Ita) also left Sweden. So this time around, champion Malmö FF saw three of their international players leaving for Italy. On top of that, Kjell Rosén also said goodbye to Malmö and started playing for AC Torino. Four other players (Hans Malmström, Kjell Hjertsson, Walfrid Ek and Gustaf Nilsson) all packed their bags and left for a club nearby, Helsingborgs IF. * 49 consecutive league matches without defeat.